Netflix Style Comic App InkyPen To Go Live Real Soon On Switch! 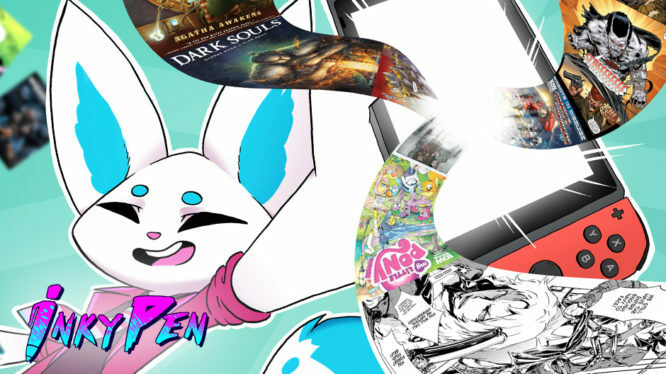 For any of you comic readers out there, you may have heard that InkyPen, the digital comic subscription app is coming to the Nintendo Switch. Well, it’s not long to wait now for Switch Users to be able to use their system to read their favourite comics as InkyPen goes live on Monday 17th of December (next week). InkyPen requires a monthly Subscription of €7.99 in order for Switch owners to use the app. An announcement trailer for InkyPen has gone live to day which, we have embedded below along with some details about what the app actually is. InkyPen was founded by a group of indie game developers who are passionate about comics which is why they love independent creators as well. InkyPen is also adding well-known titles from the indie and webcomic scene such as Daniel Lieske’s The Wormworld Saga, Andrews McMeel Universal’s Sarah’s Scribbles, Pearls Before Swine, and Big Nateas well as Studio Foglio’s Girl Genius. Papercutz, publisher of graphic novels for kids such as The Smurfs, Hotel Transylvania and Dinosaur Explorers. US comics, European comics, manga, and webcomics – thousands of comics will be available, including series such as Judge Dredd, Transformers, Robotech, X-O Manowar, Bloodshot, Metabarons, Pathfinder and Battlestar Galactica. InkyPen will also include comic adaptations of popular video game franchises such as Dark Souls, Dishonored, Tekken, and Assassin’s Creed. Classic strips such as Peanuts, Garfield, and Calvin and Hobbes will also be available. The goal is to create the best All-You-Can-Eat subscription service available for comic book fans of all kinds: newcomers and veterans alike.